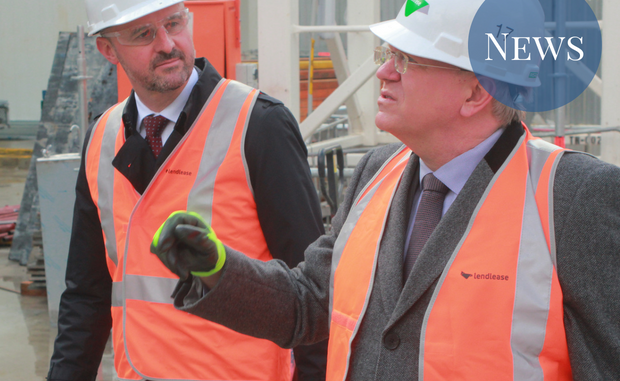 Vice Chancellor Brian Schmidt walked Andrew Barr, the Chief Minister of the ACT, around the ongoing Kambri redevelopment today. 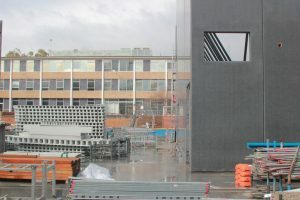 The event was held to show off the new precinct to media and encourage collaboration between the University and the ACT Government. Observer was in attendance; here’s everything we found out and some pictures of the progress. The Culture and Events building is one of six new buildings. February’s flooding caused a 3 week delay. ANU and Lendlease have not shifted on their commitment that Kambri will be ready for O-Week next year, with an opening date of 1 February 2019. 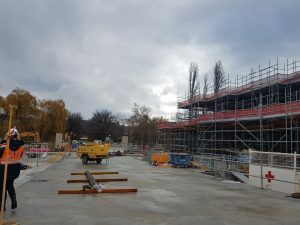 A Lendlease spokesperson assured Observer that this would be the date when the precinct is fully completed – a contrast to SA5, where landscaping and other works had to be finished after students had moved in. Schmidt, however, was more hesitant. “Your results may vary…if we get anymore floods…” he was quick to chime in. “I would say we don’t have a lot of contingency,” he conceded. Precinct to have 45 businesses – but what about ANU Bar? Kambri will house “45 shops, including dining, retail, services, book shop, grocer, bars, [and] small offices”, according to a press release. The food venues will be largely concentrated in a Melbourne-style laneway near Chifley Library, and an open eating area called “The Lawn”. Barr recounted his experience of the old ANU Bar, saying, “I think I might have seen a few bands in their early days, before they were famous, at that venue.” However, Schmidt was tight-lipped on whether the ANU Union will be given the tender for a bar in Kambri or indeed any other presence. He told Observer that negotiations were ongoing and that he had no involvement in the process. What even is a piazza? The Lendlease spokesperson described the new precinct as creating an “urban experience quite different from the garden campus” that ANU is known for. He described the “piazza” (yes he called it a piazza) as both “intimate” and “grungy”. Schmidt and Barr both emphasised how the development would integrate with the rest of the city. Schmidt emphasised the aim of the development is to create a “seamless” link between Kambri and Civic. Barr also emphasised the connection, telling media that “this redevelopment provides an opportunity to link the ACT government’s city renewal agenda with the ANU’s renewal agenda”. Noting Barr’s announcement of an Innovation Festival to be held in Canberra in 2020, Schmidt voiced his hope that ANU will “be able to host a number of events here”. The “Piazza” design includes the levelling of the area, a significant change from the multi-levelled Union Court. This will make the area more accessible to those with mobility issues. 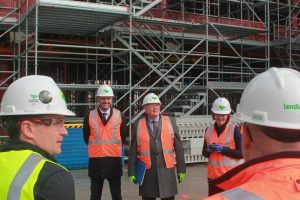 The new residential hall was described by a staff member as “Grand Designs-esque”. The new residential building looks impressive: it is a mix of concrete and timber, with the upper two floors jutting out over the lower levels. The hall will seemingly be spread across two buildings, with there also being accomodation above the cultural building. These buildings will house 450 beds. Schmidt confirmed that this accomodation will become Fenner Hall. 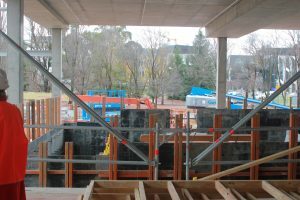 The University has been seeking to relocate the Hall due to rising maintenance costs and uncertainty over whether it will be able to continue to lease the current Northbourne Avenue location from the ACT government. However, Schmidt suggested that this move may not occur at the beginning of 2019. 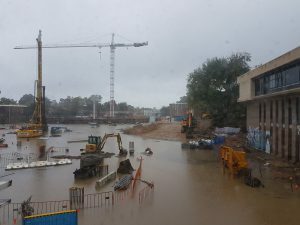 “We do have a lot of students who need accomodation, so I think we’re going to have to be flexible about exactly how we do it and when we close the existing Fenner Hall out on Northbourne,” he said. Schmidt added that although the accommodation would be primarily aimed at undergraduates, the addition of the space would take pressure off other postgraduate housing. A report commissioned this year by PARSA outlined serious levels of postgraduate homelessness. The 25m lap pool has been dug out. The walkthrough provided the first opportunity to observe the new health and fitness facilities at Kambri. As previously reported, the building will include a 25 metre pool and a Club Lime gym. 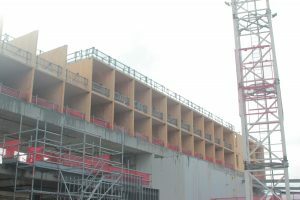 Many of the buildings use plantation timber, a relatively carbon neutral material. The construction involves a mixture of concrete and prefabricated timber. 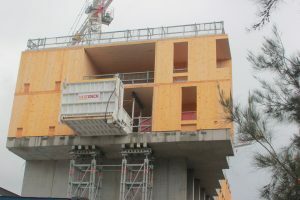 A spokesperson from Lendlease told the media that timber is one of the more carbon-neutral building materials available. The plantation-grown timber has been imported from Austria, with the spokesperson explaining that this is because its strength and density is more appropriate than Australian timber. Schmidt and Barr were positive about the development. Schmidt described the development as “a $260 million investment in our University’s future”. Barr was similarly positive, saying Kambri would be “a wonderful addition to the city of Canberra”. He said it was “a massive improvement on my time here”, and that seeing it made him consider returning as a mature-aged student. “I’d always like to continue my interest in economics, but I did get an HD in first year philosophy and never pursued that, so there’s an avenue for some future study potentially,” he joked.